Packing session in SLC, thanks Amber! Here´s some photos I just pulled off the camera, hope ya like em! Clouds rake the Fitz Massif, while condors float effortlessly on the gusts. Guillamet is the icy peak on the right. 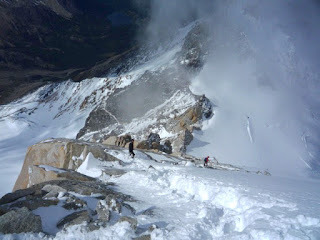 Climbers headed toward the Amy Couiour, the Brenner Ridge is the right buttress. Joel sinks his tools into an amazing runnel of ice. Joel finds Patagonian splitter cracks, with ice. The highs are the 1020 circles, just need them to move down a bit! So far the weather this season in Patagonia has been challenging for climbing larger objectives, with the exception 0f the 12 day window in early December. Since then, there has been 5 or 6 one-day climbable windows. Geographically situated at -49 degrees south latitude, the Fitz Roy Range is sandwiched between the high pressure systems typical of the northern Chile coast and the low pressure storm systems which blast Tierra del Fuego and Antartica. The opposite rotations of these global weather systems is what makes Patagonia the windiest place on Earth. I believe the large windows of perfect weather occur when high pressure systems from the north settle over the southern tip of the continent, thus diverting all low pressure to the south. 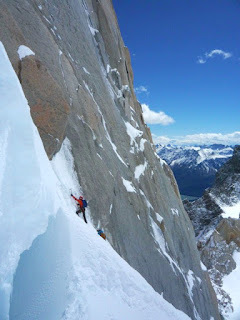 Although one of the smallest Agujas in the Fitz Roy group, Guillamet is packed with ice and mixed climbs all over its east face. If one is motivated, there are endless ascents of this neat mountain to be realized; likewise, it is often the best option for short cold and snowy weather windows. 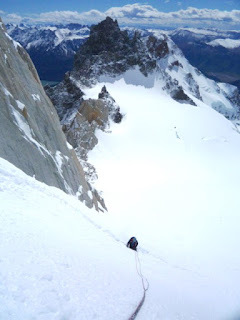 A few weeks ago, while I stayed in town with some serious stomach funk, Joel and Tim rallied to base camp at Piedra Negra and climbed a beautiful ice runnel on Guillamet's east face, basically a variation to the Guillot Couliour. A week later, another short window appeared during which Joel and Tim climbed the Brenner Ridge to the junction with the Amy couliour. 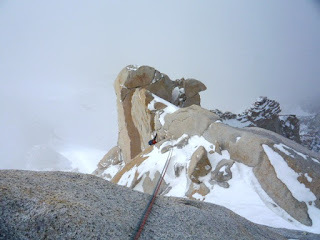 Now that my immune system is recovered, we have been sport climbing around El Chalten and keeping it tranquilo. Joel has left town to guide Aconcagua, we have plans to meet in Bariloche in a few weeks and climb in the sun for the remainder of our trip. While some become more impatient as the weather churns, I have settled into the reality of life in El Chalten. Patience is tested; one can dissolve mental obscurity formed by a society of immediate satisfaction, the clouds swirl and the view is incredible. For me, this is Patagonia´s finest lesson, and the power never wavers. These golden towers of rime and rock stand vigilant sentinels to the saga of time; we are left pondering our all too brief passage. The summit block is pretty sketchy! After psyching up in town for about 3 weeks, we could no longer sit still and returned to the mountains with our friends Camilo Lopez, Anna Pfaff, and Olov from Sweden. 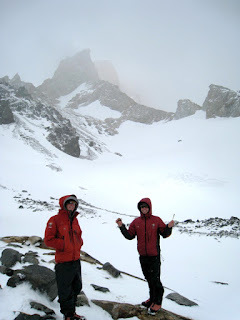 Everyone was excited to get outta El Chalten and attempt Aguja Guillamet. The forecast showed a short colder window starting last Tuesday morning, just as the snow stopped falling. 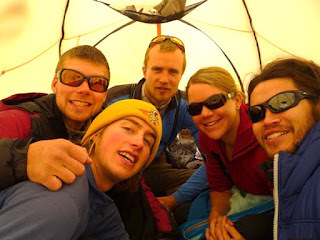 We had been tent-bound the day before (monday) by snow and wind, so we were totally amped to move when the calm winds and lightly cloudy sky greeted us in the morn. Camilo and Anna took off and started breaking knee-deep trail up to Paso Guillamet. No wind at the col and sunny! 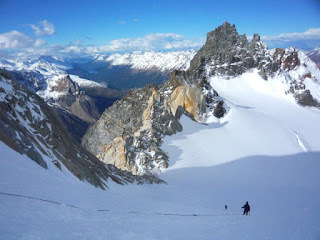 We were all planning on climbing the Amy couliour, a snow and ice climb in a gully then joining the rock ridge to the summit, about 350meters in total. 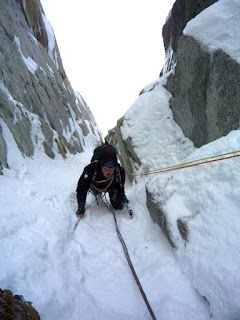 Steep snow started the couliour, then pinched down to shoulder width ice, super fun! 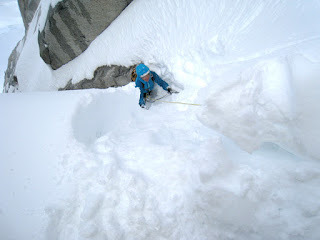 Camilo had a great lead gaining the ridge as he tunneled and cleared deep snow above us. 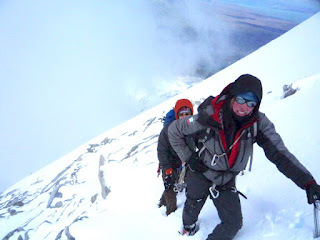 Though we had moved onto rock terrain, we wore our boots and crampons due to snow and colder temps. (I wanna go rock climbing!) Suddenly an easy handcrack becomes a lesson in crampon and glove jamming, with the occasional ice axe hook move thrown in for fun! As we gained the summit snowfield, the clouds swirled around us revealing and obscuring the incredible views of granite spires everywhere! 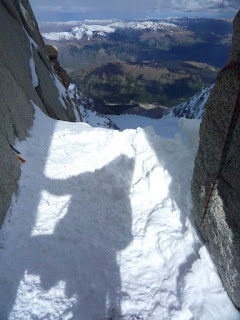 We enjoyed the summit for a while and had an awesome view of Mermoz, and the rock route we have been waiting to climb for a month! 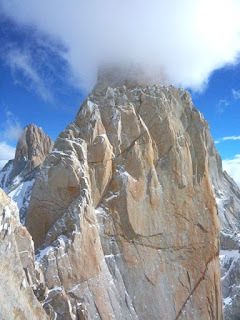 We are still amped to climb splitter Patagonian style cracks, and we might just get the chance! The descent went smooth and quickly and we devoured the rest of our food at camp then slept soundly. The next day we had a nice hike back to El Chalten and a rewarding victory asado with all our friends, Patagonia at its finest! !